When it comes to horse care, Alexanne Thibault would rather do it herself—with a little help from her family. The 20-year-old rider from Boucherville, Quebec, did double duty as groom and rider this week at the Adequan FEI North American Youth Championships at Old Salem Farm, and she was recognized for her efforts with a Best Turned Out award. 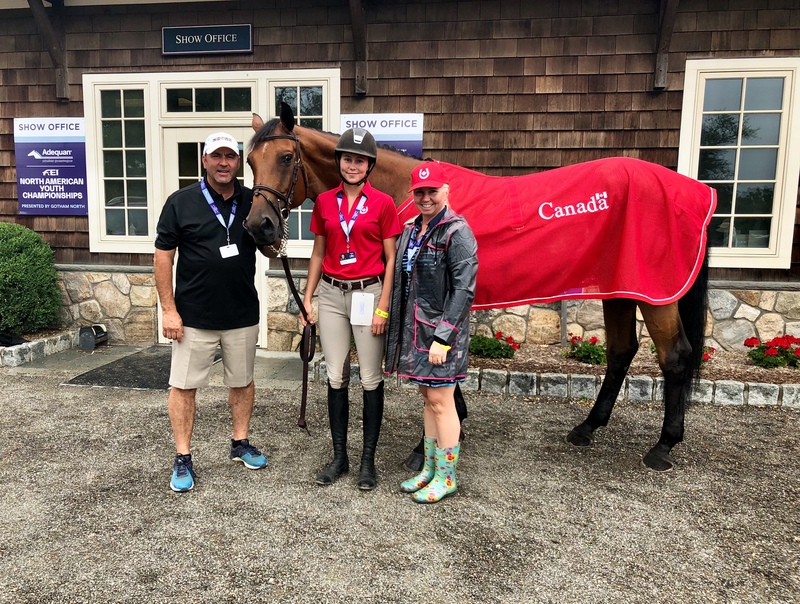 Alexanne Thibault and Chacco Prime won the Best Turned Out award at NAYC, and her parents Frederick Thibault and Suzanne Gosselin were there to cheer her on. Photo courtesy of Alexanne Thibault. Thibault, who’s competing in the young rider jumpers this weekend, has been doing her own grooming her entire riding career. She does her own mucking, bathing, braiding—all of it. Over the years her previously non-horsey dad, Frederick Thibault, has become her right-hand man. “He’s there with me when we leave [at] 5 o’clock, 6 o’clock, whatever the time, he’s always with me,” said Alexanne. So who is the horse behind the glamour? The 10-year-old Hanoverian Chacco Prime. Alexanne and Chacco Prime finished just out of the money for Team Canada in yesterday’s speed class, the first phase of the individual and team competition. Alexanne said that the gelding does get grumpy when getting groomed for shows—but only with her dad. Alexanne’s hard work has led to two other Best Turned Out awards: one at the Palgrave CSI** (Ontario) and another at the Winter Equestrian Festival (Florida). The father/daughter duo leave no stone unturned and no speck of dust unwiped. Even though it’s difficult, Alexanne said that she would feel like something was missing if she wasn’t grooming her own. When asked if she would consider ever hiring a groom, she shrugged. “When I have more horses, probably, because at some point you just don’t have a choice,” she said. “When you have three in the same class, then you can’t just rush and make everything [perfect]. Stay glued to coth.com for updates throughout the week for lots more from the Adequan FEI North American Youth Championships, and be sure you’re following us on Facebook, Twitter and Instagram @chronofhorse. We’ll have lots more from the competition in the Aug. 20 issue of the magazine.